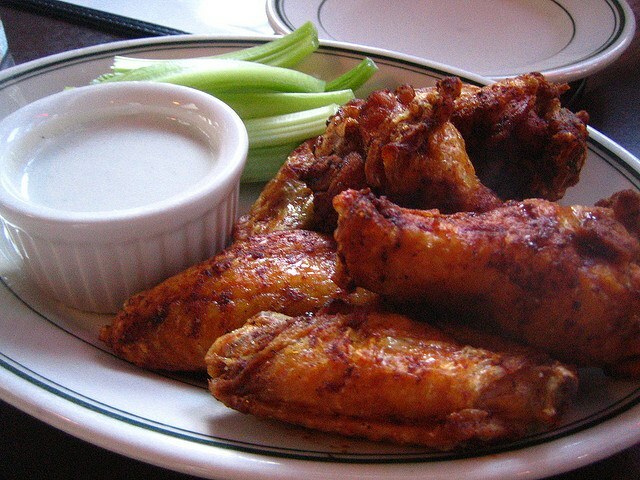 Delicious and very aromatic chicken wings "Buffalo" - the perfect dish for get-togethers with friends. Eat them with their hands without using any Cutlery. Usually cook or in a deep fryer or casserole. But there are a couple of recipes for these delicious wings in the oven. Here they are. - 1 stalked celery (optional). Cooking Buffalo wings in the oven you need to start with the preparation of the meat. The wings should be washed under running water, dry with towels or a clean linen towel, cut into 3 pieces at the joints. The tips of their wings removed, they are not needed. Next, you should prepare the marinade. To do this, mix half a liter of yogurt with a small spoon of salt, 1-2 tsp Chile, ground pepper and 5 cloves of garlic. Put wings in marinade and leave for 30-60 minutes. Then shift to covered and greased baking tray, without the marinade, and put into the oven, preheated to 200°. Bake for 30-40 minutes. If desired, at the end of cooking you can put them on the grill for 5 minutes and bring to Golden brown. Then the wings need to put in a large bowl. Then move to the cooking of the sauce, "Buffalo", the recipe follows. You need to put the saucepan on the fire, melt the 60g of butter and 2 large spoons of brown. After boiling, the mixture should be alternately add the tomato paste, a spoonful of chili sauce, garlic, black pepper, salt. Bring to boil and remove from heat. Wings to sauce for Buffalo and mix. Serve along with cheese sauce, with celery and carrot sticks. - 50 g of butter. Wash the wings, Pat dry with paper towel. Remove the tips as they are not needed. Salt and pepper the meat. Scalded with boiling water over tomatoes to remove the peel, hot pepper clear from the stalk and seeds. Peel and chop the garlic. All vegetables chopped into small pieces. Preheat the pan with oil, add hot peppers for 3-4 minutes, add garlic and fry another minute, add remaining ingredients and simmer for about 20 minutes. The liquid should completely evaporate. Then tomato puree and grind in a blender. Dip in his wings and lay on a baking sheet, greased. On top of meat pour the remaining sauce and bake in the oven until cooked. Choose any recipe for chicken Buffalo wings, cook it and serve a delicious snack family, guests, and friends.